Your teeth are the first thing people notice about you. Make a great first impression with a pearly white smile by using the Platinum Sonic Toothbrush & USB Sanitizing Case. The brush is on sale for 80% off its original price in the Daily Caller shop today. Knock an additional 15% off the sales price for a limited time. 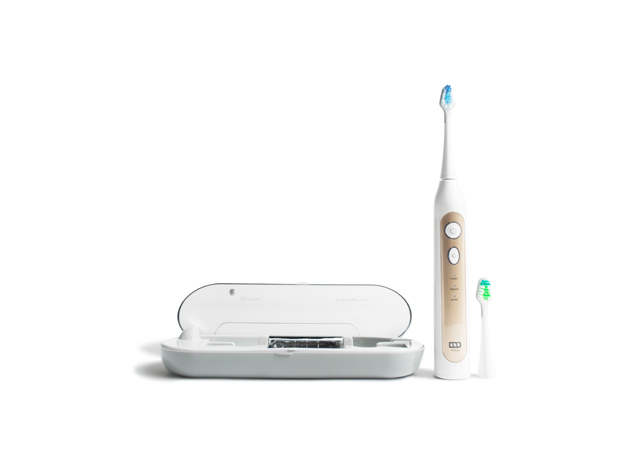 The Platinum Sonic Toothbrush & USB Sanitizing Case offers more benefits than the average electric toothbrush. Its two-minute smart auto timer helps ensure you brush for the ADA-recommended time. At 40,000 strokes per minute, tartar and plaque will disappear. Your dentist will be impressed by your healthy teeth at your next appointment. Charge and clean your brush at the same time with the sanitizing base. One charge lasts for up to 40 uses. With a shiny gold accent, you won’t want to hide the Platinum Sonic Toothbrush & USB Sanitizing Case when company comes over. You can even pack this toothbrush on trips in its compact carrying case. At $49.99, you save $200 off the original price of $259. Improve your confidence with a great smile when you buy the Platinum Sonic Toothbrush & USB Sanitizing Case in the Daily Caller shop. The price has been reduced from $259 to $49.99. Save an additional 15% with the discount code MADNESS15 bringing the final price to $42.49.